Old fishing licences make for fascinating reading. The Canterbury Float Fishing Club has discovered two old licences, one belonging to the Southern Acclimatisation District dated 1894/95 and the second from the Southland Acclimatisation Society dated 1907. Both have Tench and Perch listed as acclimatised fish and requiring a licence to fish for them. It is a pity that we had basically lost these species in the mists of time to the promotion of only trout and salmon angling interests. They are probably the best two coarse fish available in New Zealand. Southland Acclimatisation Society is now Fish and Game Southland. The Tench suited lakes and ponds, and the Perch would survive in the most unlikely rivers and streams. We wonder what would have been if these two species had had the same support as trout and salmon had in the past. New Zealand would have had the best of both worlds, trout fishing par excellence, salmon fishing, arguably the best in the world and coarse fishing to rival Europe in its variety of waters and size of fish. Catch and Release is the motto of coarse anglers and would have ensured Coarse fishing continued almost without further assistance in re-stocking programmes from the acclimatisation societies. Tench and Perch are found in some of the most unlikely spots in the South Island, surviving unaided and unnoticed. The club is determined to find every location of these two acclimatised fish in the South Island. Many dozens of fishing trips over the past decade, following up reports of strange and unidentified fish species has resulted in great opportunities to practice coarse fishing in various parts of the South Island, making friends along with way with farmers, whose land had the pond or stream within its boundaries, resulting from these investigative forays. Here is the story of the two old fishing licences. 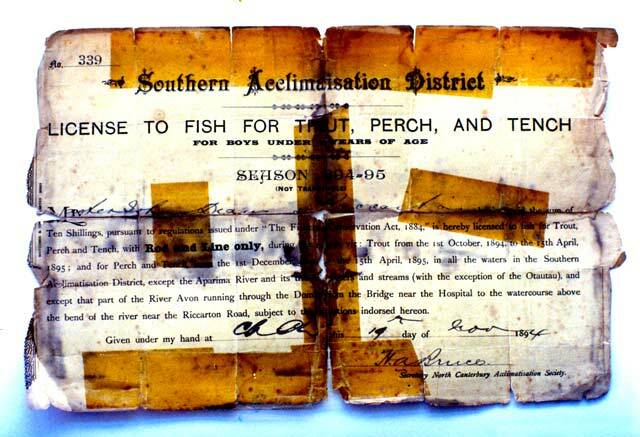 This Southern Acclimatisation District fishing licence was issued for the 1894-95 season. Canterbury Acclimatisation Society. The cost of the licence was 10 shillings which must have been a considerable sum in late Victorian times! What is perhaps the Province’s oldest surviving licence is of great interest to members of the Canterbury Float Fishing Club. Dated 19 November 1894 and issued by the Southern Acclimatisation District for the 1894/95 season, the licence covers “Trout, Perch and Tench”. The inclusion of the two species of European coarse fish confirms that their distribution in local waters must have been sufficiently widespread to warrant official recognition 123 years ago. Nowadays the continuing discovery of new waters containing coarse fish, and the potential specimen weights of each species under New Zealand conditions, keep the increasing membership of the club in keen anticipation. The licence shows, ”for boys under 16 years of age”, cost 10 shillings – a not inconsiderable sum in late Victorian times – and was issued to “Master John Deans” of Riccarton. Master John was the grandson of John and Jane Deans, two notable and much-respected figures in Canterbury’s pioneering history. Junior members of the Deans family enjoyed many successful seasons of trout fishing in the Avon opposite their Riccarton homestead. Rods were usually fashioned from bamboo clumps growing on the spot. The old licence forms part of a historic archive collection of Deans family private papers recently catalogued by Graham Hemming – a member of the Canterbury Float Fishing Club. 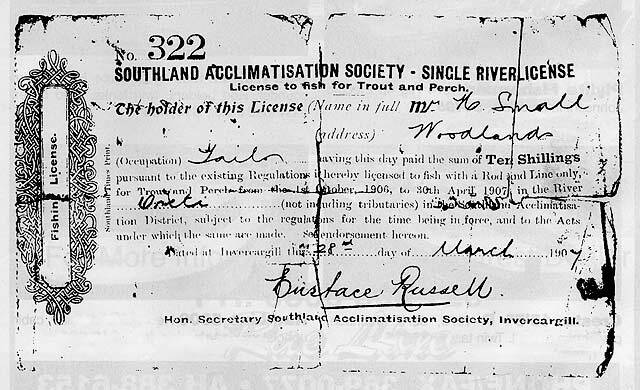 Fishing Licence issued by the Society on 28 March 1907 to Mr H Small of Woodlands by Eustace Russell, Hon Secretary of the Southland Acclimatisation Society, Invercargill. Issued by the Society on 28 March 1907 to Mr H Small of Woodlands by Eustace Russell, Hon Secretary of the Southland Acclimatisation Society, Invercargill. Mr Small was the great-grandfather of Chris Morrall, a member of the Canterbury Float Fishing Club. The front of the licence says ”Licence to fish for Trout and Perch”, however on the reverse of the licence, it states ”This licence does not entitle the holder thereof to sell, or catch for sale, Trout, Perch and Tench. We have never located Tench in Southland, but there they were in 1907. We wonder what waters still hold stocks of tench around Invercargill? The club hopes this article stimulates some anglers to do a bit of searching for these elusive fish in the South Island. We are prepared to visit any waters rumoured to contain ‘strange fish’ and try and catch the fish using coarse fishing methods. Do drop us a line or phone us if you have heard of such waters. We’d be only too happy to increase the opportunities for coarse fishing on the ’/Mainland”.